Demo to be showcased at GDC next week. Sherlock Holmes developer Frogwares has announced The Sinking City, an open-world, investigation, Lovecratian game based on the Cthulhu Mythos. The player incarnates a private investigator in 1920s, who finds himself in a city of New England, Oakmont Massachusetts. It’s currently suffering from extensive waterflood, and its cause is clearly supernatural. The city trembles on the brink of madness. Platforms and release date are to be announced. Can you investigate this beleaguered town and untangle the tragic extent of its failings or will you be driven beyond madness yourself? 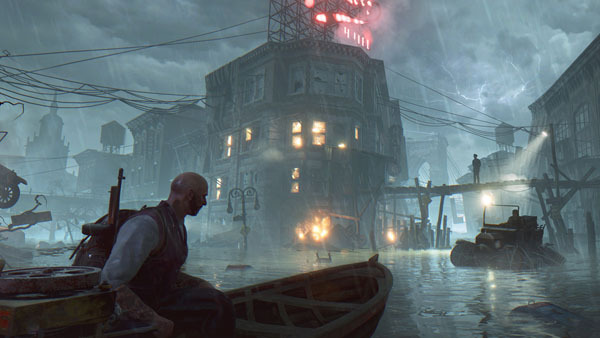 Both The Sinking City and the latest Sherlock Holmes game, Sherlock Holmes: The Devil’s Daughter, will have demos showcased at the Game Developers Conference in San Francisco next week. View the first screenshot and some artwork at the gallery. For more Cthulhu goodness, Focus Home Interactive and Cyanide are developing a Call of Cthulhu game for release across consoles and PC in 2017.